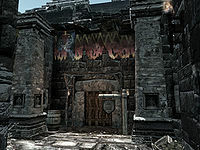 Sadri's Used Wares is a general shop in the Gray Quarter of Windhelm. It is owned by Revyn Sadri, a Dunmer trader and common level trainer for Speech. It consists of one area only, Sadri's Used Wares. NOTE: Like all other stores, Sadri's Used Wares has a number of fixed wares on display scattered around the main trading room. These can be bought from the proprietor and will disappear from the room when purchased. For a list of these special items, see this section. Without the displayed merchandise the main trading room becomes quite empty and consists mostly of valuable kitchen utensils. 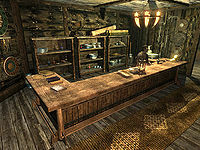 The huge counter has a copy of Ancestors and the Dunmer on top and, hidden behind the counter, a copy of the Speech skill book 2920, Second Seed, v5. A few weapons are hung on the southeastern wall, including an iron war axe, a steel greatsword, an iron battleaxe, and an iron sword, along with three shields, an iron shield, a hide shield, and a banded iron shield. Through the doorway to the south is a storage room with a wardrobe with random clothes, an end table with clutter, and the store's strongbox on a set of shelves. The doorway to the north leads to Sadri's private quarters where he sleeps every night between midnight and 8am. The southwestern corner contains a small table with a salt pile, a goat cheese wedge, a slice of bread, and some baked potatoes. Along the western wall is a cooking pot. The adjacent corner has two food sacks and some shelves with several items, including an apple pie, a gourd, a sample of scaly pholiota, a sample of troll fat, three red apples, a bottle of Nord mead, and the Business Ledger. The owned bed stands along the northern wall, with a handy bottle of wine next to the pillow. The northeastern corner has a wardrobe with some assorted clothes. A dresser along the eastern wall contains clothes and has another bottle of wine and a bottle of Nord mead on top. The following items are sitting out in the store on counters, shelves, or tables. They can be purchased or taken for free if your disposition with Sadri is high enough. They respawn after ten days. This is the merchandise found in Sadri's merchant chest. These items are only available if purchased from the merchant; they cannot be pickpocketed or stolen. They are restocked every two days. If Revyn Sadri dies, Aval technically becomes owner of Sadri's Used Wares. However, he never takes over running the store: he never enters the store, and even if he were to enter the store, he does not own the store's merchant chest. This issue has been addressed by version 2.0.4 of the Unofficial Skyrim Patch; Idesa Sadri has been selected to fill the backup alias and will take over when Revyn dies.